Ahh!!! He Went! He Went! Ian was sitting at the table having a snack after his nap when all of a sudden he got down. He looked at me and then ran for the bathroom and pointed to his potty seat. We got his diaper off and HE WENT!! He was a little quick in getting up, but my little man knew he had to go and went to the bathroom all on his own. Kind of odd to announce to the world, but it’s exciting for me! Since we were visiting the Grandparents this weekend, we stopped at a local park that Jesse used to go to all the time. The park had this massive play structure and Ian was able to run all over the place. Ian and Grandpa found this towards the end of our visit. Ian had his 18 month checkup this past week (I know, I’m late posting this). He weighed in at 25.5 lbs, which is good since he didn’t lose any weight this time. He has grown, he’s now 32.75 inches long. This all puts him in the 25-50 percentile for his weight and the 50-75 percentile for his height; the doc noticed he’s starting to slim down and that’s not really surprising considering how much he likes to move. I swear, if you can get Ian to sit still for 5 minutes, I will be shocked. His head is 19 inches, which is in the 5-75 percentile. There’s actually some questions about this number since it would mean he lost .75 inches since his 15 month check up. The nurse thinks the previous nurse meant 18 inches, but everything in his chart says 19. However, unless someone invents a time machine, we’ll never know the truth. 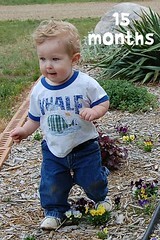 This time around, Ian left the doctors office with only one vaccination – Hep A. From what was implied at the visit, Ian is done with his vaccinations until he gets ready for kindergarten, so he’ll have a few years reprieve from the needle. Although, this time, he handled it a lot better. I think a lot of it was because he received it from his favorite nurse and she was so not wanting to give it to him when she came in either. She had Ian sit on the edge of the table, and while holding my hands, he took it in his thigh and started crying. It was actually amusing. He didn’t cry for very long; in fact he was pretty much done by the time I picked him up. However, the look on his face when the needle went in, it was priceless. Kind of like “what the hell woman!” I did get a giggle out of it. Overall, his appointment went really well and the Doc seemed happy with his progress. He made sure to ask me if Ian had started saying any words yet and I drew a complete blank. I couldn’t believe I did that, but I did get out enough words that Ian has been saying that seemed to work for the Doc. Now, the highlights for the past three months…first off, Ian is teething like crazy. He’s had a couple of molars come in as well as a new canine. I also want to say that another molar will be popping up soon too. Ian pretty much has a mouth full of teeth now. Ian’s comprehension level is very high. He so knows what you’re saying even if he can’t say it yet. We’ve been able to tell him to “go put daddy’s socks in the basket” and he does exactly that. Not only that, but we can even say “can you put this where you put daddy’s socks?” and whether there’s a basket there or not, he’ll put whatever we gave him exactly where we want it. I’ve even been able to ask him to bring me the plate from the living room, while I’m standing in the kitchen and can’t see the plate, and he goes and gets it. Our little man is starting to become freakishly smart and it’s amazing. Today he helped me pick up the living room and was actually a help rather than a hindrance. He knows where the shoes go and there have been times when he has put Jesse’s shoes in their correct place when daddy didn’t. Today, I was able to tell him to go get his cup, which he then looked at me and I told him “it’s in your room”, and he went right to his room and got his cup. First try. Ian has finally called me mama and has done it without laughing. However, now it’s “mama MAMA!” everything. There are times I think he’s just saying it because he can. Once he got that done, Ian has been saying all sorts of things. His favorite word is the obvious…NO! Everything is NO. It doesn’t matter what it is, Ian’s answer to everything is no. We really need to get him to learn yes and understand the difference. :) Jesse has even gotten him to say the colors while they were reading What Makes a Rainbow. Ian is really starting to talk now and as long as you listen to what he is trying to say, it’s not that hard to figure out what he wants. He also says “thank you”, “please”, “ellow” (yellow and can point it out occasionally). He also gets a kick out of say “bye bye” or “hi” and will wave on command or whenever he feels like it. Ian is starting to want to be more and more independent. He knows what he wants and he makes sure you know it as well and that he will get it soon. He’s starting to figure out how to put his shoes on, even putting the right foot into the right she. Also, he’s been helping me get himself dressed in the mornings. He can get his arms through the shirt holes all on his own, plus he knows to put his feet in his pants, I just have to hold them up. I no longer have to lift him into the tub; he gets his toys and throws them in the tub and then climbs in after them. There are times when we’ll find him in the tub even when it isn’t bath time, but that’s what he wants, so he does it. Speaking of bath time, we’ve started a new routine at night. Ian now brushes his teeth and gets read to each night. It’s all apart of the plan. He takes his bath and then he brushes his teeth (and he does it himself after a little help from mama) and then Daddy reads him a story before bed. He has really adjusted to this new routine well and we’re even thinking we might be able to move him to his big boy bed after Christmas. Once we get done brushing his teeth, I’ll tell him to find daddy and off he goes; then when we say “ready for bed”, he’ll yell “READ” and races off to his room so he can climb into daddy’s chair before him. He even knows which book it is that Jesse reads from. Of course, there are times that Jesse lets him sit in the chair at the beginning, but only when Ian is reading to him. Then Jesse sits on the floor, but when it’s Jesse’s turn, then they switch seats. Ian is really loving his books and we’re thinking we have another bookworm on our hands. Ian knows and understands the word read and loves going through his books on his own. Of course, he loves it even more when Jesse or I read to him. There was one afternoon that we literally spent 45 minutes reading in his room. I have never been prouder to get a headache than that time. We went through a good dozen books and he picked them all out. The biggest change for Ian this summer was the new house. He finally got his own backyard which means we’ve been outside a lot this summer. There is also a park pretty nearby that we try and go to as often as we can. Plus, Ian has his very own room. He is no longer sharing a room with mama and daddy and all three of us are happy about that. We took Ian to the fireworks display in Clawson for Independence Day and I don’t think enjoyed them as much as he did last year. Mainly because he wanted to be very curious and check everything out and we wanted to keep our seats for the show. He did get a new treat while we were waiting and that was cotton candy. So not that greatest thing in the world for him to have, but he really enjoyed it. I think Jesse had fun giving him some and watching his reactions. There was a small drama event this summer, Ian twisted his ankle for the first time. He was doing what he shouldn’t have been and playing in Toby’s water and slipped. At first I thought he had hit his head with the way he was carrying on (he cried for a good 30 minutes), but I realized later that it was because I kept trying to put him down so I could distract him with something and everytime I did that, the pressure on his ankle hurt. It didn’t become obvious what had happened until Jesse got home and had Ian walk to him. I should say attempt to walk to him since Ian couldn’t stand up. Has anyone ever tried to keep a 16 month old off his feet? It’s not easy, I can tell you that. Ian is definitely getting taller and more active. He has started climbing ladders and has also realized he can use these skills to get pretty much anywhere. I don’t think I’m ready for this (in fact I know I wasn’t ready for it), but Jesse was urging him on. Men! Ian has also figured out he can reach the counters now. We’ve been having to watch what we put where because if Ian is interested, then he’ll pull it down…which happened to the banana cream pie we had. Nothing is safe anymore and it’s making me thankful that I really don’t have much in the area of decorations (although Jesse would disagree with me on this). Ian has a thing for puppies and dogs right now. He loves going up to dogs and wanting to pet them. Which makes me really nervous since he has no fear of dogs and has no problems running up to strange dogs in the park. Thankfully, we’ve been really lucky to date, but I’m really hoping our luck holds. The other day, we were out in the church yard and there were a couple of dogs in another backyard and Ian ran straight to them. They were barking their heads off and that gave Ian enough of a pause that I was able to get to him before he made it to the fence, but thankfully he seemed to catch the idea that maybe he didn’t want to meet them. Okay, I just noticed how long this post actually is, so I’ll stop for now. One last thought though…Ian sure is growing and his personality is definitely coming out. After being in the house for two months, I finally got Ian’s bedroom painted and finished. We’re still missing a toy chest/shelf for him, but I heard a rumor that he was going to get one for Christmas, so he’ll have to deal with the boxes for a little bit longer. While we were roaming the aisles of Lowe’s back when we first moved in, we came across this rug and thought it would be perfect for Ian. He ended up loving it, especially once we found more cars for him to run all over it. After looking at it for a bit, it dawned on me that I could use it as the focus piece for his room and starting designing the room around it. We originally had a completely different green to go on the bottom half, one we actually used Lowe’s color match system to go with the trees on the rug, but it ended up being really watery and I had to take it back. I’m actually glad I did since I found spring leaves. The color goes really well with the sonic blue that is on the upper half of the walls. Between the two colors, it has a very cartoony feel to it. For the border, we had thought of doing a winding road, but I’m not that confident in my artistic skills so I went with doing just a straight road all the way around. The colors I used were city storm and tangy, and they really go well together. We also have to thank Aunt Kay for giving us the bookshelf in Ian’s room. The shelf was originally white, but Ian and I (yes he did help) painted it using the sonic blue and spring leaves colors from his wall. We painted the shelves the green and the sides the blue and it works really well. It almost looks like the shelves are a part of the wall if you’re not looking at it to closely. 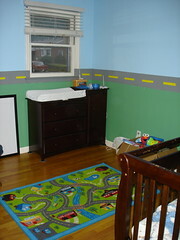 I’m really pleased with the way Ian’s room turned out. 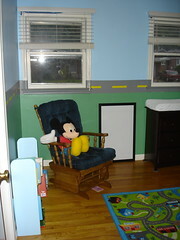 This is his first bedroom and he’ll never get another one, so I wanted it to be a little extra special since I have no idea what we’re going to be able to do in the future. For Ian’s nursery, when it was a part of our room, we had an African/jungle animal theme going and we really didn’t get to do too much since he was in with us for the first 16 months. Now for his toddler years, we’re moving towards a transportation theme and I’m really having fun setting it up for him. The last thing I really need to find (other than wall prints) is a bed set for him. I don’t want to do the cliche thing and get the Disney’s Cars bedset, but I do want to find some kind of car or transportation theme bedset. He’s still in the crib for a bit, so it has to fit his mattress, so I’m on the lookout for one. Any suggestions, let me know. So I figured I should probably put some content up here since I’ve been posting a lot of videos. First off, not all of the videos have been posted. I’ve been uploading a ton of clips to YouTube and didn’t want to overload the site. So if you want to see what I’ve been doing, check out my YouTube channel for everything Ian. Ian has his 18th month check up next week, so I won’t go into what he’s been doing lately, but instead, I’ll tell you all about this past weekend. For the second year in a row, we spent it at Gramps’ house. It wasn’t really planned that way, but we ended up out there again and this time we had some excited and some drama. On Saturday, we spent the day at Grandma Britten’s enjoying some good company with the extended family and good food. Ian got his first experience with the beanbag toss and loved it. He kept getting in the way and was a pretty good handicap for most of the players. We were out at Grandma’s pretty much all day and Ian did really good. He didn’t get a nap in on the ride down to BC, and only slept for about 15 minutes before getting to Gramps’. I think being outside helped a lot. That night, he went to bed pretty easy. He was a tired monkey. On Sunday, we had a pretty relaxing day, spending most of it outside. Gramps has been working his tail off the past couple of months (thanks to mama, aunt lori, and his own mother), so he was looking forward to not doing much of anything. That was fine with us, since Ian got to run around a huge backyard (I so have yard envy) and Gramps even put up a swing for him. After dinner, we went and checked out the new playground up at the elementary and it was actually pretty cool. They had this worm like contraption that acted like a teeter-toddler, but had multiple points where a couple of people could sit on it. Gramps and Mama got on the ends and Ian had fun sitting in the middle. Ian had to check out all of the equipment and he had fun for a bit, but he was ready to go home after about 20 minutes. He was able to ride in the red wagon all the way to the park, but on the way home, he wanted to help push a little. It made walking home take a little longer, but Ian had fun and it tired him out some. 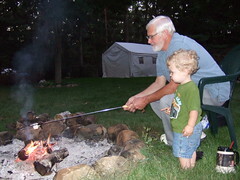 That night, Ian had his first s’mores over the weekend. He was right there with us when we roasted them, sitting patiently in my lap at times, and enjoying every bite of it. We made them the simply way, using chocolate chip cookies, but Ian didn’t have a problem with that. Well, mama did a little since Ian had been filching cookies all day, but we were on a mini-vacation. The drama I mentioned earlier wasn’t too bad, Ian just took a trip through the fire and ended up with some split ends. 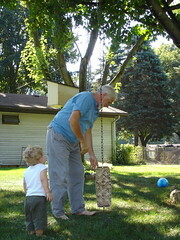 Monday morning, Ian was outside with Gramps, pulling the wagon around, and he wasn’t watching where he was going. Next thing he knows, he was in the fire pit, but thankfully not that close to the fire. Gramps was telling me later that he could see it happen, but wasn’t quick enough to catch him. Oh well, he needed a haircut anyway and got one today. 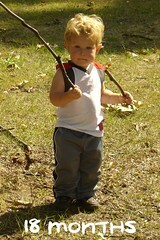 Ian didn’t get hurt or anything, but he did get startled and he learned not to get too close to the hot rocks. So overall, a lesson learned. So that was our labor day weekend. Nothing too exciting, but still a lot of fun. I got him to repeat those after me while going through his “what makes a rainbow” book. Maybe tomorrow we can get him on video doing it.